Barbados ( or ) is a sovereign island country in the Lesser Antilles. It is 34 kilometres (21 mi) in length and up to 23 kilometres (14 mi) in width, covering an area of 432 square kilometres (167 sq mi). It is situated in the western area of the North Atlantic and 100 kilometres (62 mi) east of the Windward Islands and the Caribbean Sea; therein, it is about 168 kilometres (104 mi) east of the islands of Saint Vincent and the Grenadines and 400 kilometres (250 mi) north-east of Trinidad and Tobago. Barbados is outside of the principal Atlantic hurricane belt. Barbados was visited by Spanish navigators in the late 15th century and claimed for the Spanish Crown. It first appears on a Spanish map from 1511. The Portuguese visited the island in 1536, but they left it unclaimed, with their only remnants being an introduction of wild hogs for a good supply of meat whenever the island was visited. The first English ship, the Olive Blossom, arrived in Barbados in 1624. They took possession of it in the name of King James I. In 1627 the first permanent settlers arrived from England, and it became an English and later British colony. In 1966, Barbados became an independent state and Commonwealth realm, retaining Queen Elizabeth II as Head of State. It has a population of 277,821 people, mostly of African descent. Despite being classified as an Atlantic island, Barbados is considered to be a part of the Caribbean, where it is ranked as a leading tourist destination. In 2011 Barbados ranked second in the Americas (after Canada) and 16th globally on Transparency International's Corruption Perception Index. The origin of the name Barbados is either the Portuguese word Barbados or the Spanish equivalent los Barbados, both meaning "the bearded ones" It is unclear whether "bearded" refers to the long, hanging roots of the bearded fig-tree (Ficus citrifolia), indigenous to the island; or to the allegedly bearded Caribs once inhabiting the island; or, more fancifully, to the foam spraying over the outlying reefs giving the impression of a beard. In 1519, a map produced by the Genoese mapmaker Visconte Maggiolo showed and named Barbados in its correct position. Furthermore, an island in the Leewards that is very close in name is Barbuda and was once named Las Barbudas by the Spanish. The uncertainty lies in which European nation arrived first in Barbados. According to some sources it was the Spanish during the early Voyages of Christopher Columbus. Others believe the Portuguese, en route to Brazil, were the first Europeans to come upon the island. 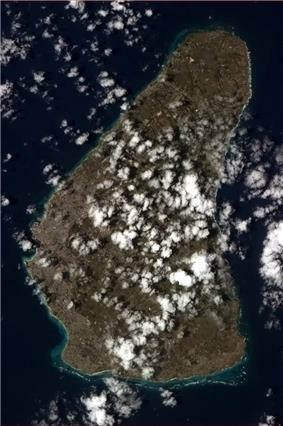 The original name for Barbados in the Pre-Columbian era was Ichirouganaim according to accounts by descendants of the indigenous Arawakan-speaking tribes in other regional areas, with possible translations including "Red land with white teeth", "Redstone island with teeth outside (reefs)", or simply "Teeth". Other names or nicknames associated with Barbados include "Bim" and "Bimshire". The origin is uncertain but several theories exist. The National Cultural Foundation of Barbados says that "Bim" was a word commonly used by slaves and that it derives from the phrase "bi mu" or either ("bem", "Ndi bem", "Nwanyi ibem" or "Nwoke ibem") from an Igbo phrase meaning "my people" or "my place". In colloquial or literary contexts, "Bim" can also take a more deific tone, referring to the "goddess" Barbados. The words Bim and Bimshire are recorded in the Oxford English Dictionary and Chambers Twentieth Century Dictionaries. Another possible source for "Bim" is reported to be in the Agricultural Reporter of 25 April 1868, The Rev. N. Greenidge (father of one of the island's most famous scholars, Abel Hendy Jones Greenidge) suggested the listing of Bimshire as a county of England. Expressly named were "Wiltshire, Hampshire, Berkshire and Bimshire". Lastly in the Daily Argosy (of Demerara, i.e. Guyana) of 1652 it referred to Bim as a possible corruption of the word "Byam", who was a Royalist leader against the Parliamentarians. That source suggested the followers of Byam became known as Bims and became a word for all Barbadians. Amerindian settlement of Barbados dates to about the 4th to 7th centuries AD, by a group known as the Saladoid-Barrancoid. In the 13th century, the Kalinago arrived from South America. 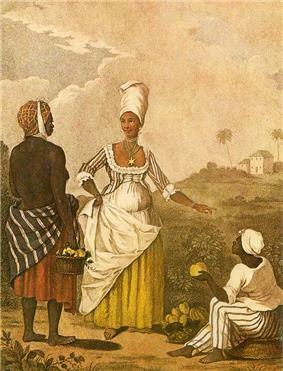 The Spanish and Portuguese briefly claimed Barbados from the late 16th to the 17th centuries.The Arawaks are believed to have fled to neighbouring islands. Apart from possibly displacing the Caribs, the Spanish and Portuguese left little impact and left the island uninhabited. Some Arawaks migrated from British Guiana (modern day Guyana) in the 1800s and continue to live in Barbados. From the arrival of the first English settlers in 1627–1628 until independence in 1966, Barbados was under uninterrupted English and later British governance and was the only Caribbean island that did not change hands during the colonial period. In the very early years, the majority of the population was white and male, with African slaves providing little of the workforce. Cultivation of tobacco, cotton, ginger and indigo was handled primarily by European indentured labour until the start of the sugar cane industry in the 1640s. As Barbados' economy grew, Barbados developed a large measure of local autonomy through its founding as a proprietary colony. Its House of Assembly began meeting in 1639. Among the island's earliest leading figures was the Anglo-Dutch Sir William Courten. The 1780 hurricane killed over 4,000 people on Barbados. In 1854, a cholera epidemic killed over 20,000 inhabitants. At emancipation in 1833, the size of the slave population was approximately 83,000. Between 1946 and 1980, Barbados' rate of population growth was diminished by one-third because of emigration to Britain. Barbados has been an independent country since 30 November 1966. It functions as a constitutional monarchy and parliamentary democracy, modelled on the British Westminster system, with Elizabeth II, Queen of Barbados, as head of state, represented locally by the Governor-General, Elliott Belgrave, and the Prime Minister as head of the government. The number of representatives within the House of Assembly has gradually increased from 24 at independence to its present total of 30 seats. During the 1990s, at the suggestion of Trinidad and Tobago's Patrick Manning, Barbados attempted a political union with Trinidad and Tobago and Guyana. The project stalled after the then Prime Minister of Barbados, Lloyd Erskine Sandiford, became ill and his Democratic Labour Party lost the next general election. However, Barbados continues to share close ties with Trinidad and Tobago and with Guyana, claiming the highest number of Guyanese immigrants after the United States, Canada, and the United Kingdom. Barbados functions as a two-party system, the two dominant parties being the ruling Democratic Labour Party and the opposition Barbados Labour Party (BLP). Until 2003, each party had served two terms in office alternately. The general election of 2003 victory for the Barbados Labour Party gave it a third term in office, as a result of which it achieved a total of fourteen continuous years in government, from 1994 until the 2008 elections. Under that administration, the former Prime Minister, The Right Honourable Owen S. Arthur, acted as the Regional Leader of the Caribbean Single Market (CSM). The Honourable David Thompson, who was elected Prime Minister of Barbados in 2008, died of pancreatic cancer on 23 October 2010 and was succeeded by his Deputy Prime Minister, Freundel Stuart, was sworn in as head of government the same day. A general election held on 21 February 2013 returned the DLP to power with a 16 to 14 majority and the Honourable Freundel Stuart was re-elected as Prime Minister. Barbados has had several third parties since independence: The People's Pressure Movement, formed in the early 1970s, which contested the 1976 elections; The National Democratic Party, which contested the 1994 elections; and the People's Democratic Congress, which contested the 2008 elections. Apart from these, several independents have stood for election, but no independent has yet won a seat in Parliament. The Constitution of Barbados is the supreme law of the nation. The Attorney General heads the independent judiciary. Historically, Barbadian law was based entirely on English common law with a few local adaptations. At the time of independence, the Parliament of the United Kingdom lost its ability to legislate for Barbados, but the existing English and British common law and statutes in force at that time, together with other measures already adopted by the Barbadian Parliament, became the basis of the new country's legal system. Legislation may be shaped or influenced by such organisations as the United Nations, the Organization of American States, or other international bodies to which Barbados has obligatory commitments by treaty. Additionally, through international co-operation, other institutions may supply the Barbados Parliament with key sample legislation to be adapted to meet local circumstances before enacting it as local law. New Acts are passed by the Barbadian Parliament, and require royal assent by the Governor-General to become law. In Barbados, camouflage clothing is reserved for military use, being forbidden for civilians, including children, to wear. Barbados has been identified as one of the nations in which the International Press Institute would like to see the removal of criminal libel from the list of offences. Magistrates' Courts: Covering Criminal, Civil, Domestic, Domestic Violence, and Juvenile matters. But can also take up matters dealing with Coroner's Inquests, Liquor Licences, and civil marriages. Further, the Magistrates' Courts deal with Contract and Tort law where claims do not exceed $10,000.00. The Supreme Court: is made up of High Court and Court of Appeals. High Court: Consisting of Civil, Criminal, and Family law divisions. Court of Appeal: Handles appeals from the High Court and Magistrates' Court. It hears appeals in both the civil, and criminal law jurisdictions. It may consist of a single Justice of Appeal sitting in Chambers; or may sit as a Full Court of three Justices of Appeals. The Caribbean Court of Justice (CCJ), (based in Port of Spain, Trinidad and Tobago), is the court of last resort (final jurisdiction) over Barbadian law. It replaced the London-based Judicial Committee of the Privy Council (JCPC). The CCJ may resolve other disputed matters dealing with the Caribbean (CARICOM) Single Market and Economy (CSME). Barbados is a full and participating member of the Commonwealth of Nations, and the Caribbean Court of Justice (CCJ), which pertains only to Barbados, Belize and Guyana. In 2001 the Caribbean Community heads of government voted on a measure declaring that the region should work towards replacing the UK's Judicial Committee of the Privy Council with the Caribbean Court of Justice. Barbados is an original member (1995) of the Economic Partnership Agreement with the European Commission. The pact involves the Caribbean Forum (CARIFORUM) subgroup of the Group of African, Caribbean, and Pacific states (ACP). CARIFORUM is the only part of the wider ACP-bloc that has concluded the full regional trade-pact with the European Union. Trade policy has also sought to protect a small number of domestic activities, mostly food production, from foreign competition, while recognising that most domestic needs are best met by imports. In 2013, CARICOM called for European nations to pay reparations for slavery and established an official reparations commission. The Barbados Defence Force has roughly 600 members; within it, 12-to-18-year-old adolescents make up the Barbados Cadet Corps. The defence preparations of the island nation are closely tied to defence treaties with the United Kingdom, the United States, and the People's Republic of China. The Royal Barbados Police Force is the sole law enforcement agency on the island of Barbados. Barbados is the easternmost island in the Lesser Antilles. It is flat in comparison to its island neighbours to the west, the Windward Islands. The island rises gently to the central highland region, with the highpoint of the nation being Mount Hillaby, in the geological Scotland District, 340 metres (1,120 ft) above sea level. The island is situated in the Atlantic Ocean, east of the other West Indies Islands. 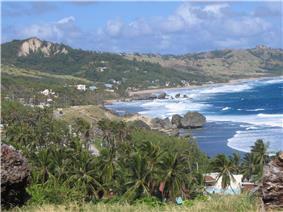 In the parish of Saint Michael lies Barbados' capital and main city, Bridgetown. Other major towns scattered across the island include Holetown, in the parish of Saint James; Oistins, in the parish of Christ Church; and Speightstown, in the parish of Saint Peter. Barbados lies on the boundary of the South American and the Caribbean Plates. The shift of the South American plate beneath the Caribbean plate scrapes sediment from the South American plate and deposits it above the subduction zone forming an accretionary prism. The rate of this depositing of material allows Barbados to rise at a rate of about 25 millimetres (0.98 in) per 1,000 years. This subduction means geologically the island is composed of coral roughly (90 m or 300 ft thick), where reefs formed above the sediment. The land slopes in a series of "terraces" in the west and goes into an incline in the east. A large proportion of the island is circled by coral reefs. The erosion of limestone rock in the North East of the island, in the Scotland District, has resulted in the formation of various caves and gullys, some of which have become popular tourist attractions such as Harrison's Cave and Welchman Hall Gully. On the Atlantic East coast of the island coastal landforms, including stacks, have been created due to the limestone composition of the area. The country generally experiences two seasons, one of which includes noticeably higher rainfall. Known as the "wet season", this period runs from June to November. By contrast, the "dry season" runs from December to May. The annual precipitation ranges between 40 inches (1,000 mm) and 90 inches (2,300 mm). From December to May the average temperatures range from 21 to 31 °C (70 to 88 °F), while between June and November, they range from 23 to 31 °C (73 to 88 °F). 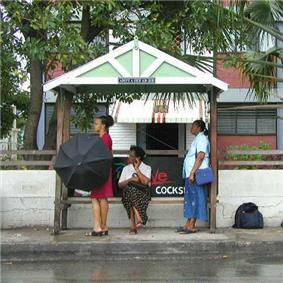 On the Köppen climate classification scale, much of Barbados is regarded as a Tropical monsoon climate (Am). However, gentle breezes of 12–16 kilometres per hour (8–10 mph) abound throughout the year and give Barbados a civilised climate which is moderately tropical. Infrequent natural hazards include earthquakes, landslips, and hurricanes. Barbados is often spared the worst effects of the region's tropical storms and hurricanes during the rainy season. The far eastern location in the Atlantic Ocean puts the country just outside the principal hurricane strike zone. On average, a major hurricane strikes about once every 26 years. The last significant hit from a hurricane to cause severe damage to Barbados was Hurricane Janet in 1955, and in 2010 the island was struck by Hurricane Tomas, but this caused only minor damage across the country. The island is susceptible to environmental pressures. As one of the world's most densely populated isles, the government worked during the 1990s to aggressively integrate the growing south coast of the island into the Bridgetown Sewage Treatment Plant to reduce contamination of offshore coral reefs. As of the 2000s, a second treatment plant has been proposed along the islands' west coast. With such a dense populace, Barbados has placed large efforts on protecting its underground aquifers. As a coral-limestone island, Barbados is highly permeable to seepage of surface water into the earth. As such, a major emphasis by the government has been placed on protecting the catchment areas (in specific surface areas known as buffer zones) that lead directly into the huge network of underground aquifers and streams. On occasion illegal squatters have breached these areas, and the government has removed squatters to preserve the cleanliness of the underground springs which provide the island's drinking water. The government has placed a huge emphasis on keeping Barbados clean with the aim of protecting the environment and preserving offshore coral reefs which surround the island. Many initiatives to mitigate human pressures on the coastal regions of Barbados and seas is the Coastal Zone Management Unit (CZMU). Barbados has nearly 90 km of coral reefs just offshore and two protected marine parks have been established off the west coast. Overfishing is another threat which faces Barbados. Barbados is host to four species of nesting turtles (green turtles, loggerheads, and leatherbacks) and has the second largest hawksbill turtle breeding population in the Caribbean. The driving of vehicles on beaches can crush nests buried in the sand and such activity should be avoided in nesting areas. Though on the opposite side of the Atlantic, and some 3000 miles west of Africa, Barbados is one of many places in the American continent which experiences heightened levels of mineral dust from the Sahara Desert. Some particularly intense dust episodes have been blamed partly for the impacts on the health of coral reefs surrounding Barbados or asthmatic episodes, but evidence has not wholly supported the former such claim. St. George and St. Thomas are located in the middle of the country and are the only two parishes without coastlines. 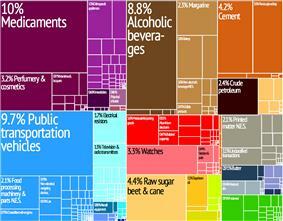 Graphical depiction of the national product exports in 28 color-coded categories. Barbados is the 51st richest country in the world in terms of GDP (Gross Domestic Product) per capita, has a well-developed mixed economy, and a moderately high standard of living. According to the World Bank, Barbados is classified as being in its 66 top high income economies of the world. A 2012 self-study in conjunction with the Caribbean Development Bank revealed 20% of Barbadians live in poverty, and nearly 10% cannot meet their basic daily food needs. Historically, the economy of Barbados had been dependent on sugarcane cultivation and related activities, but in the late 1970s and early 1980s it has diversified into the manufacturing and tourism sectors. Offshore finance and information services have become important foreign exchange earners, and there is a healthy light manufacturing sector. 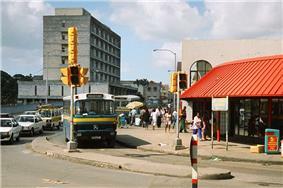 Since the 1990s the Barbados Government has been seen as business-friendly and economically sound. The island saw a construction boom, with the development and redevelopment of hotels, office complexes, and homes. This slowed during the 2008 economic crisis. Recent government administrations have continued efforts to reduce unemployment, encourage foreign direct investment, and privatise remaining state-owned enterprises. Unemployment has been reduced to 10.7 in 2003. The economy contracted in 2001 and 2002 due to slowdowns in tourism, consumer spending and the impact of the 11 September 2001 attacks, but rebounded in 2003 and has shown growth since 2004. Traditional trading partners include Canada, the Caribbean Community (especially Trinidad and Tobago), the United Kingdom and the United States. Business links and investment flows have become substantial: as of 2003 the island saw from Canada CA$ 25 billion in investment holdings, placing it as one of Canada's top five destinations for Canadian foreign direct investment (FDI). Businessman Eugene Melnyk of Toronto, Canada, is said to be one of Barbados' richest permanent residents. It has been reported that the year 2006 would have been one of the busiest years for building construction ever in Barbados, as the building-boom on the island entered the final stages for several multi-million dollar commercial projects. The European Union is assisting Barbados with a €10 million program of modernisation of the country's International Business and Financial Services Sector. Barbados maintains the third largest stock exchange in the Caribbean region. At present, officials at the stock exchange are investigating the possibility of augmenting the local exchange with an International Securities Market (ISM) venture. Barbados has a population of about 281,968 and a population growth rate of 0.33% (Mid-2005 estimates). It ranks as: the fourth most densely populated country in the Americas (18th globally), and the 10th most populated island country in the region, (101st globally). Close to 90% of all Barbadians (also known colloquially as "Bajan") are of Afro-Caribbean descent ("Afro-Bajans") and mixed-descent. The remainder of the population includes groups of Europeans ("Anglo-Bajans" / "Euro-Bajans") mainly from the United Kingdom and Ireland, along with Asians, mostly Chinese and Indians (both Hindu and Muslim). Other groups in Barbados include people from the United Kingdom, United States and Canada. Barbadians who return after years of residence in the United States and children born in America to Bajan parents are called "Bajan Yankees", a term considered derogatory by some. Generally, Bajans recognise and accept all "children of the island" as Bajans, and refer to each other as such. The Indo-Guyanese, an important part of the economy due to the increase of immigrants from partner country Guyana. There are reports of a growing Indo-Bajan diaspora originating from Guyana and India. They introduced roti and other Indian dishes to Barbados' culture. Mostly from southern India and Hindu states, they are growing in size but smaller than the equivalent communities in Trinidad & Guyana. Euro-Bajans (4% of the population) have settled in Barbados since the 17th century, originating from England, Ireland and Scotland. In 1643, there were 37,200 whites in Barbados (86% of the population). More commonly they are known as "White Bajans". Euro-Bajans introduced folk music, such as Irish music and Highland music, and certain place names, such as "Scotland", a mountainous region. Among White Barbadians there exists an underclass known as Redlegs; the descendants of Irish slaves, and prisoners imported to the island. Many additionally moved on to become the earliest settlers of modern-day North and South Carolina in the United States. Chinese-Barbadians are a small portion of Barbados' Asian demographics, smaller than the equivalent communities of Jamaica and Trinidad. Most if not all first arrived in the 1940s during the Second World War, originating mainly from the then British territory of Hong Kong. Many Chinese-Bajans have the surnames Chin, Chynn or Lee, although other surnames prevail in certain areas of the island. Chinese food and culture is becoming part of everyday Bajan culture. Lebanese and Syrians form the Arab community on the island, and the Muslim minority among them make up a small percentage of the Muslim population. The majority of the Lebanese and Syrians arrived in Barbados through trade opportunities. However, the numbers are dwindling due to emigration to other countries. Jewish people arrived in Barbados just after the first settlers in 1627. Bridgetown is the home of Nidhe Israel Synagogue, the oldest Jewish synagogue in the Americas, dating from 1654, though the current structure was erected in 1833 replacing one ruined by the hurricane of 1831. Tombstones in the neighbouring cemetery date from the 1630s. Now under the care of the Barbados National Trust, the site was deserted in 1929 but was saved and restored by the Jewish community beginning in 1986. The Muslim-Indian Barbadian community is largely of Gujarati ancestry. Many small businesses in Barbados are run and operated by Muslim-Indian Bajans. The average life expectancy is 72 years for males and 77 years for females. Barbados and Japan have the highest per capita occurrences of centenarians in the world. English is the official language of Barbados, and is used for communications, administration, and public services all over the island. In its capacity as the official language of the country, the standard of English tends to conform to the vocabulary, pronunciations, spellings, and conventions akin to, but not exactly the same as, those of British English. A regional variant of English, referred to locally as Bajan, is spoken by most Barbadians in everyday life, especially in informal settings. In its full-fledged form, Bajan sounds markedly different from the Standard English heard on the island. The degree of intelligibility between Bajan and general English, for the general English speaker, depends on the level of creolised vocabulary and idioms. A Bajan speaker may be completely unintelligible to an English speaker from another country. Bajan is influenced by other Caribbean English dialects. Most Barbadians of African and European descent are Christians (95%), chiefly Anglicans (40%). Other Christian denominations with significant followings in Barbados are the Catholic Church, Pentecostals (Evangelicals) Jehovah's Witnesses, the Seventh-day Adventist Church and Spiritual Baptists. The Church of England was the official state religion until its legal disenfranchisement by the Parliament of Barbados following independence. Other religions in Barbados include Hinduism, Islam, Bahá'í, Judaism and Wicca. The influence of the English on Barbados is more noticeable than on other islands in the West Indies. A good example of this is the island's national sport: cricket. Barbados has brought forth several great cricketers, including Sir Garfield Sobers and Sir Frank Worrell. Citizens are officially called Barbadians. The term "Bajan" (pronounced BAY-jun) may have come from a localised pronunciation of the word Barbadian, which at times can sound more like "Bar-bajan". The largest carnival-like cultural event that takes place on the island is the Crop Over festival. As in many other Caribbean and Latin American countries, Crop Over is an important event for many people on the island, as well as the thousands of tourists that flock to there to participate in the annual events. The festival includes musical competitions and other traditional activities, and features the majority of the island's homegrown calypso and soca music for the year. The male and female Barbadians who harvested the most sugarcane are crowned as the King and Queen of the crop. Crop Over gets under way at the beginning of July and ends with the costumed parade on Kadooment Day, held on the first Monday of August. In music, Grammy winner Rihanna (born in Saint Michael) is one of Barbados' best-known artists. In 2009 she was appointed as an Honorary Ambassador of youth and culture for Barbados by the late Prime Minister, David Thompson. Singer-songwriter Shontelle, the band Cover Drive, and musician Rupee also originate from Barbados. Grandmaster Flash (born Joseph Saddler in Bridgetown in 1958) is a hugely influential musician of Barbadian origin, pioneering hip-hop DJing, cutting, and mixing in 1970s New York. The Merrymen are a well known Calypso band based in Barbados, performing from the 1960s into the 2010s. Similar to other nations within the Commonwealth of Nations, all Barbadian citizens are covered by national healthcare. The life expectancy for Barbados residents as of 2011 is 76.74 years. The crude birth rate is 12.23 births per 1,000 people, and the crude death rate is 8.39 deaths per 1,000 people. The infant mortality rate is 11.63 infant deaths per 1,000 live births. Barbados has over twenty polyclinics throughout the country in addition to the main Queen Elizabeth Hospital (General Hospital) located in Bridgetown. In 2011, the Government of Barbados signed a Memorandum of Understanding to lease its 22-acre Saint Joseph Hospital site to the Denver, Colorado based America World Clinics. Under the deal, the group will use Barbados as one of its main destinations for medical tourism at that facility. The government also announced it would begin constructing a new $900 million state-of-the-art hospital to replace the QEH. 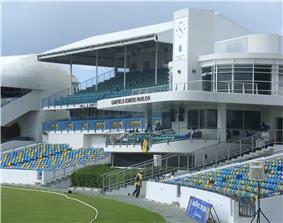 Kensington Oval, in Bridgetown, hosted the 2007 Cricket World Cup final. Cricket is one of the most followed games in the nation and Kensington Oval is often referred to as the "Mecca in Cricket" due to its significance and contributions to the sport. As in other Caribbean countries of British colonial heritage, cricket is very popular on the island. The West Indies cricket team usually includes several Barbadian players. In addition to several warm-up matches and six "Super Eight" matches, the country hosted the final of the 2007 Cricket World Cup. Barbados has produced many great cricketers including Sir Garfield Sobers, Sir Frank Worrell, Sir Clyde Walcott, Sir Everton Weekes, Gordon Greenidge, Wes Hall, Charlie Griffith, Joel Garner and Malcolm Marshall. Horse racing takes place at the Historic Garrison Savannah close to Bridgetown. Spectators can pay for admission to the stands, or else can watch races from the public "rail", which encompasses the track. Obadele Thompson is a world-class sprinter from Barbados; he won a bronze medal at the Olympic Games of 2000 in the 100m sprint. Ryan Brathwaite, a hurdler, reached the 2008 Olympic semi-finals in Beijing. Brathwaite also earned Barbados its first ever medal at the world championships in Berlin, Germany on 20 August 2009, when he won the men's 110 meter hurdles title. The 21-year-old timed a national record of 13.14 seconds to win the Gold Medal. Polo is very popular amongst the rich elite on the island and the "High-Goal" Apes Hill team is based in the St James's Club. It is also played at the private Holders Festival ground. In golf, the Barbados Open is an annual stop on the European Seniors Tour. In December 2006 the WGC-World Cup took place at the country's Sandy Lane resort on the Country Club course, an 18-hole course designed by Tom Fazio. The Barbados Golf Club is the other main course on the island. Sanctioned by the PGA European Tour to host a PGA Seniors Tournament in 2003 and it has also hosted the Barbados Open on several occasions. Basketball is a popular sport, played at school or college, and is increasing in popularity, as is volleyball, though volleyball is mainly played indoors. Motorsports also play a role, with Rally Barbados occurring each summer and being listed on the FIA NACAM calendar. The presence of the trade winds along with favourable swells make the southern tip of the island an ideal location for wave sailing (an extreme form of the sport of windsurfing). Netball is also popular with women in Barbados. Barbadian team The Flyin' Fish, are the 2009 Segway Polo World Champions. In addition to being one of the world's most densely populated countries, Barbados also has one of the most dense road networks in the world. Although Barbados is only about 34 kilometres (21 mi) at its widest point, a car journey from Six Cross Roads in St. Philip (south-east) to North Point in St. Lucy (north-central) can take one and a half hours or longer, thanks to the country's narrow, winding and rough roads. Barbados has half as many registered cars as citizens in the country. The first letter of a vehicle's licence plate designates its usage or owner's registered parish of residence. "Z" and "ZR" are for taxis; "H" for rental cars; "B" for buses and minibuses; "CD" for diplomatic cars; and "3D" or "7D" for defence force vehicles, while "ML" or "MP" with green plates usually designate military, police or government vehicles. As regards residence, "X" is for Christ Church; "A" for St. Andrew; "G" for St. George; "S" for St. James; "J" for St. John; "O" for St. Joseph; "L" for St. Lucy; "M" for St. Michael; "E" for St. Peter; "P" for St. Philip; and "T" for St. Thomas. Public transport on the island is relatively convenient, with "route taxis", called "ZRs" (pronounced "Zed-Rs"), travelling to most points on the island. These small buses can at times be crowded, as passengers are generally never turned down, regardless of the number. However, they will usually take the more scenic routes to destinations. They generally depart from the capital Bridgetown or from Speightstown in the northern part of the island. Including the ZRs, there are three bus systems running seven days a week (though less frequently on Sundays). There are ZRs, the yellow minibuses and the blue Transport Board buses. A ride on any of them costs BBD$2.00. The smaller buses from the two privately owned systems ("ZRs" and "minibuses") can give change; the larger blue buses from the government-operated Barbados Transport Board system cannot, but do give receipts. Children in school uniform ride for free on the government buses and for $1.50 on the minibuses and ZRs. 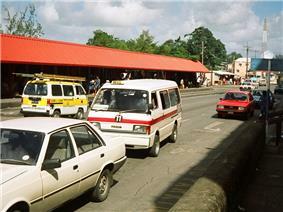 Most routes require a connection in Bridgetown. Some drivers within the competitive privately owned systems are reluctant to advise persons to use competing services, even if those would be more suitable. Some hotels also provide visitors with shuttles to points of interest on the island from outside the hotel lobby. There are several locally owned and operated vehicle rental agencies in Barbados but there are no multi-national companies. The island's lone airport is the Grantley Adams International Airport. It receives daily flights by several major airlines from points around the globe, as well as several smaller regional commercial airlines and charters. The airport serves as the main air-transportation hub for the eastern Caribbean. In the first decade of the 21st century it underwent a US$100 million upgrade and expansion. There is also a helicopter shuttle service, which offers air taxi services to a number of sites around the island, mainly on the West Coast tourist belt. Air and maritime traffic is regulated by the Barbados Port Authority. ^ a b "GeoHive – Barbados population". GeoHive. Retrieved 16 December 2013. ^ a b c d "Barbados". International Monetary Fund. Retrieved 18 April 2013. ^ "2014 Human Development Report Summary". United Nations Development Programme. 2014. pp. 21–25. Retrieved 27 July 2014. ^ a b "Barbados". 29 Aug 2006. Archived from the original on 15 Oct 2007. (fco.gov.uk), updated 5 June 2006. ^ Sauer, Carl Ortwin (1969) . Early Spanish Main, The. University of California Press. pp. 192–197. ^ Secretariat. "Barbados – History". ^ HRM Queen Elizabeth II (2010). "History and present government – Barbados". ^ surveys and indices 2011. Transparency International. ^ "AXSES Systems Caribbean Inc., The Barbados Tourism Encyclopaedia". Barbados.org. 8 February 2007. Retrieved 4 July 2010. ^ : History of Barbados"Britannica Encyclopaedia". Britannica.com. Retrieved 4 July 2010. 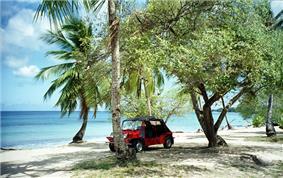 ^ Barbados the Red Land with White Teeth: Home of the Amerindians. Barbados Museum & Historical Society. Archived from the original on 5 May 2010. Retrieved 14 May 2010. A temporary exhibit which examined some of the preliminary excavations conducted at the dig site at Heywoods, St. Peter. 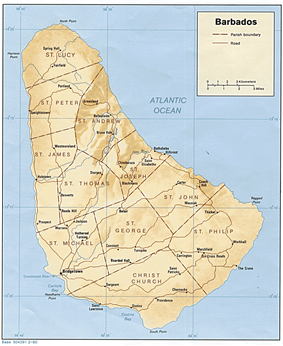 ^ Barbados – Geography / History. Fun 'N' Sun Publishing Inc. 2008. Retrieved 14 May 2010. ^ Faria, Norman (17 June 2009). "Guyana Consul (Barbados) Visit to Former Amerindian Village Site in B'dos". Guyana Chronicle. Pan-Tribal Confederacy of Indigenous Tribal Nations. p. 2. Retrieved 14 May 2010. Adjacent to the park, there is still a fresh water stream. This as a main reason the village was here. A hundred or so metres away is the sea and a further five hundred metres out across a lagoon was the outlying reef where the Atlantic swells broke on the coral in shallow waters. As an aside, the word "Ichirouganaim", said to be an Arawak word used by the Amerindians to describe Barbados, is thought to refer to the imagery of "teeth" imagery of the waves breaking on the reefs off most of southern and eastern coasts. ^ Drewett, Peter (1991). Prehistoric Barbados. Barbados Museum and Historical Society. ^ Drewett, Peter (2000). Prehistoric Settlements in the Caribbean: Fieldwork on Barbados, Tortola and the Cayman Islands. Archetype Publications Ltd.
^ a b c Carrington, Sean (2007). A~Z of Barbados Heritage. Macmillan Caribbean Publishers Limited. p. 25. ^ Beckles, Hilary. A History of Barbados: From Amerindian Settlement to Caribbean Single Market (Cambridge University Press, 2007 edition). ^ Descendants of Princess Marian. (PDF). Retrieved on 19 February 2012. ^ "Barbados". Library of Congress Country Studies. ^ "Barbados – population". Library of Congress Country Studies. ^ Chasing after an elusive union at the Wayback Machine (archived June 24, 2009). Jamaica Observer, 20 July 2003. ^ "About Barbados". Ministry of Foreign Affairs and Foreign Trade, Government of Barbados. 2011. Retrieved 16 October 2011. 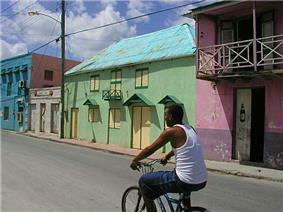 ^ "Barbados elections: A sweeping change". Caribbean360.com. 19 February 2012. Retrieved 30 December 2009. ^ "Barbados PM dies at 48". CNN. 25 October 2010. ^ The official Constitution of Barbados (1966) version. 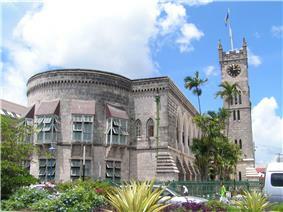 ^ a b "Law Courts of Barbados". Lawcourts.gov.bb. Retrieved 4 July 2010. ^ "Slavery reparations: Blood money". ^ Staff writer (7 August 2006). "Barbados turns to China for military assistance". Caribbean360.com. ^ Logan, Gabi. "Geologic History of Barbados Beaches". ^ "Barbados Sightseeing – Animal Flower Cave". Leigh Designs. Little Bay House. 2010. Retrieved 10 July 2011. The Animal flower Cave is the island's lone accessible sea-cave and was discovered from the sea in 1780 by two English explorers. The cave's coral floor is estimated to be 400,000 to 500,000 years old and the "younger" coral section above the floor is about 126,000 years old. The dating was carried out by the German Geographical Institute, and visitors can see a "map" of the dating work in the bar and restaurant. The cave now stands some six feet above the high tide mark even though it was formed at sea level. This is because Barbados is rising about one inch per 1,000 years, which is yet another indication of the cave's age. ^ "Average and Record Conditions at Bridgetown, Barbados". BBC Weather. Archived from the original on 20 February 2007. Retrieved 10 September 2009. ^ Hurricane Tomas lashes Caribbean islands. BBC News, 30 October 2010. ^ Domestic and Industrial Wastewater Treatment Techniques in Barbados. Cep.unep.org. Retrieved on 20 April 2014. ^ Perspectives: A continuing problem and persistent threat. Barbadosadvocate.com. Retrieved on 20 April 2014. ^ PERSPECTIVES: Squatting – a continuing problem. Barbadosadvocate.com (24 March 2008). Retrieved on 20 April 2014. ^ Squatters get thumbs down from MP Forde. Nationnews.com (30 June 2010). Retrieved on 20 April 2014. ^ Barbados' CZMU in demand. Barbadosadvocate.com (4 February 2012). Retrieved on 20 April 2014. ^ Centre for Resource Management and Environmental Studies, The University of the West Indies. 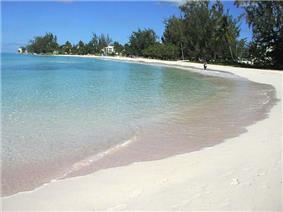 ^ Caribbean Travel: Swim with the turtles in Barbados. Thestar.com (13 March 2012). Retrieved on 20 April 2014. ^ Sea Turtles – Dive Operators Association of Barbados, Barbados Blue Inc.
^ Saharan Dust Impacts and Climate Change. (PDF) . Retrieved on 20 April 2014. ^ The Effects of African Dust on Coral Reefs and Human Health. Coastal.er.usgs.gov (15 April 2014). Retrieved on 20 April 2014. ^ The Impact of African Dust on Childhood Asthma Morbidity in Barbados. Commprojects.jhsph.edu. Retrieved on 20 April 2014. ^ World Bank – Country Groups.. Retrieved 5 October 2009. ^ "20 percent in poverty". Caribbean Broadcasting Corporation. 20 April 2012. Retrieved 22 April 2012. ^ "BBC News – Barbados profile – Overview". British Broadcasting Corporation. 22 December 2013. Retrieved 6 April 2014. ^ "Melnyk – one of the wealthiest". NationNews.com. 29 October 2011. Retrieved 6 April 2014. ^ Morris, Roy (2 January 2006). "Builders paradise". The Nation Newspaper. Archived from the original on 4 January 2009. Retrieved 29 July 2009. Industry sources are warning, however, that while the boom will bring many jobs and much income, ordinary Barbadians hoping to undertake home construction or improvement will be hard pressed to find materials or labour, given the large number of massive commercial projects with which they will have to compete. ... Construction magnate Sir Charles 'COW' Williams, agreeing that this year will be "without doubt" the biggest ever for the island as far as construction was concerned, revealed that his organisation was in the final stages of the construction of a new $6 million plant at Lears, St Michael to double its capacity to produce concrete blocks, as well as a new $2 million plant to supply ready-mixed concrete from its fleet of trucks. "The important thing to keep in mind is that the country will benefit tremendously from a massive injection of foreign exchange from people who want to own homes here," Sir Charles said. ^ Lashley, Cathy (24 July 2009). "Barbados signs agreement with EU". gisbarbados.gov.bb. Retrieved 29 July 2009. ^ "Treaty network an advantage in securities trading". ^ Byfield, Judith Ann-Marie; Denzer, LaRay and Morrison, Anthea (2010). Gendering the African diaspora: women, culture, and historical change in the Caribbean and Nigerian hinterland. Indiana University Press. pp. 39–. ^ Best, Tony (9 April 2005) Bajan secrets to living long at the Wayback Machine (archived December 11, 2007). nationnews.com. ^ "Baha'u'llah". Bci.org. Retrieved 4 July 2010. ^ "Crop Over Festival". 2camels.com. Retrieved 30 July 2009. ^ Apes Hill Polo • Apes Hill Club. Apeshillclub.com. Retrieved on 19 February 2012. ^ Harris, Alan (26 July 2009). "Barbados Segway Polo team 2009 World Champions". Burns, Sir Alan, History of the British West Indies. George Allen and Unwin Ltd, London England, 1965. Frere, Samuel, A Short History of Barbados: From its First Discovery and Settlement, to the End of the Year 1767. London: J. Dodsley, 1768. Gragg, Larry Dale, 'Englishmen transplanted: the English colonisation of Barbados, 1627–1660. Oxford University Press, 2003. Hamshere, Cyril, The British In the Caribbean. Cambridge, MA: Harvard University Press, 1972. Newman, Simon P. A New World of Labor: The Development of Slavery in the British Atlantic. Philadelphia, PA: University of Pennsylvania Press, 2013. O'Shaughnessy, Andrew Jackson, An Empire Divided: The American Revolution and the British Caribbean. Philadelphia, PA: University of Pennsylvania Press, 2000. Overview Video—Barbados Tourism Investment Inc. (Courtesy of US Television). Videography on YouTube, by the Ministry of Energy and the Environment, under the Office of the Prime Minister. Sandy Lane Hotel, Barbados 11 November 2011, on Where in the World is Matt Lauer?, NBC Today Show. This article incorporates public domain material from the CIA World Factbook document "2003 edition". Italics indicate Commonwealth realms, which each share the same person as Queen. 2. In 1931, Canada and other British dominions obtained self-government through the Statute of Westminster. See Canada's name. 4. Now the San Andrés y Providencia Department of Colombia.